Upon our return to Thailand, we decided to treat ourselves with an all-inclusive retreat. A beautiful place where we could soak in the hot springs, walk along the groomed paths, and fill up our plates at buffet-style meals. 10 days of food, drink, and accommodation all included in the low, low price of 2000 baht (~$65 CAD) per person. Let me guess… you’re thinking – how is that price even possible? Because this was no ordinary all-inclusive vacation… this was a 10-day Buddhist Silent Meditation Retreat at the International Dhamma Heritage at Wat Suan Mokkh. The first thing we noticed upon arrival is that paying your tab doesn’t guarantee you a place. Registration day began with personal “interviews” – the only question I was asked during my 15 minute interview was “what do you want to get out of this retreat?”…. the vast majority of it was actually a staff member explaining the rules and expectations of the retreat to make sure you’re up to them. This is no token step, either. The schedule and rules are strict and if you’re not 100% ready to follow them, the retreat simply isn’t for you. Depending on your attention to detail, you may have noticed a few things. First, there are only two meals each day. That’s not a typo… that’s all there is. Breakfast and lunch, no supper. Both meals are vegetarian. Breakfast is essentially rice porridge with a few veggies for good measure and, when you’re lucky… bananas. Lunch is much more substantial – typically brown rice, a fried noodle dish, a curry, and a dessert. Tea time means hot soy milk, usually of the chocolate variety. *Spoiler alert* On Day 9, the schedule is blown apart. The entire day is left open as meditation time. Complete silence is the order of the day – there are no dhamma talks or verbal instructions, and no scheduled group meditation times. The whole point is to go at your own rhythm. To aid you with this, the menu is cut back to a single meal at breakfast time, with two teas scheduled in the afternoon. The retreat make no accommodations for picky eaters, though they do offer a small evening snack at tea time to anyone with a legitimate medical reason to need it (diabetics or pregnant women, for example). Chores are simple, easy tasks to be done mindfully… raking leaves, wiping tables, cleaning toilets, etc. The wake-up gong rings at 4 am sharp. 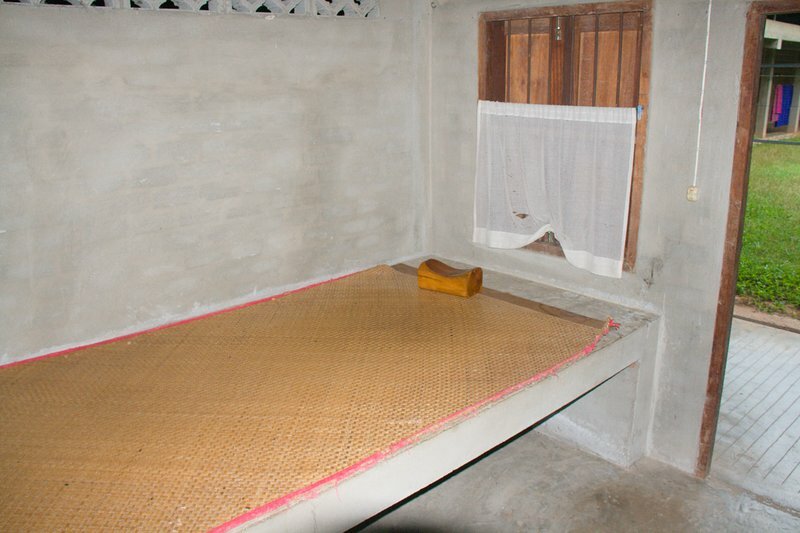 Most people don’t have a difficult time getting up at this hour, since the luxurious accommodations (a small concrete box of a room with concrete bed, wooden pillow, and straw mat) pretty much guarantee they were already awake and waiting for the gong to go off so they could leave the “comfort” of their beds. Guys and gals are separated for the duration of the retreat. Dorm rooms are in separate buildings and the common dining hall and meditation halls are divided by gender. Finally, the meditation retreat is meant to be silent. For 10 days, not a word or sound should pass through your lips unless you have an emergency or you sign up for a personal interview on Days 3-6. Seems pretty straightforward, right? Well, here’s the part of that rule that you might not expect: complete silence does not only mean no talking, it means no technology, no music, no games, no reading and no writing. At all. For the entire 10 days. The idea is to avoid analysis of the experience and just be in the moment. You’re not even supposed to write in a journal, though nearly everyone breaks that rule. This all means, with the exception of the dhamma talks, you are entirely alone with your mind for 10 days with nothing to distract it from itself. All of these strict rules and removal of luxuries are intended to prepare you for meditation and to be in line with the Eight Buddhist Precepts. Think you could be alone with yourself for 10 days? Could you embrace a concrete bed and wooden pillow? Let us know and we’ll let you know all about our retreat experience in our next post. Wow. That’s all I gotta say. Amazing you could do that. I could not. You lost me at 4:00am…but the bed takes the cake. Wow!